Following previous features on Billy Houliston, Bobby Ancell, Barry Nicholson and Dominic Matteo, this completes the set of articles on Dumfries born ex Scotland full internationalists. If the question is asked as to who is Raith Rovers` greatest ever player, no doubt a smorgasbord of answers will be offered. The most famous is probably Jim Baxter – keepie uppie at Wembley for Scotland and world class at Rangers until the leg break playing against Rapid Vienna in December ‘64 (it was in the four month lay off in which he started drinking to his detriment). Probably the ex Rover to have achieved the most in football is Alex James, the Captain and pivotal playmaker for the great Arsenal side of the 1930s that dominated English football. The guy who did the most for Rovers rather than at another club could be argued with convinction to be someone from Dumfries, Willie McNaught. McNaught also became the third player born a Doonhamer to play for the Scotland first team. McNaught was born in Dumfries on 5th May 1922. In the late 1930s he was playing for Park Rovers, a recently formed club based on a core of ex St Joseph’s College pupils. The youngest team in the Dumfries league, they were increasingly fulfilling their potential just before the start of World War 2. They reached the last eight of the Scottish Juvenile Cup when they lost away at Douglas Water Primrose in a game played in a sleet storm. When a friendly game was arranged as a return the Dumfries club chalked up a 6-0 home win. (Park Rovers F.C. July 1939. McNaught is front row, 3rd right. The tallest standing player in the back row is Sam Halliday, brother of Dave Halliday. 2nd left in the front row is future QoS Director and Chairman, Sammy Harkness. One position beside him to the centre is Stan Smith, brother of John Smith who kept goal for QoS in the 1930s). It was during the war that McNaught scored most of his 15 goals for Raith. At the time he was playing at inside left. McNaught went on to form part of the half back line that is still iconically revered at Raith Rovers along with Andy Young and Andy Leigh. It was though at left back that versatile McNaught gained all his senior international caps. With the resumption of national league football in 1946/47 after the end of World War II, Raith were in Scotland`s second tier. 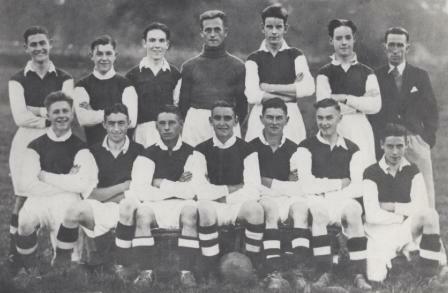 They improved season on season with finishes of sixth and fourth before being promoted as B Division champions in 1949. In the same season McNaught made it to the League Cup Final with Raith losing 2-0 to Rangers. From then they stayed in Scotland`s top flight until the season after McNaught`s 1962 departure. 1950 brought a Scottish Cup quarter final against Rangers taking the Glasgow side to two replays. Then followed McNaught’s senior international debut, a 3-1 win at Ninian Park in Cardiff against Wales. Lawrie Reilly of Hibs scored two and Liverpool’s Billy Liddell scored the third. A second cap followed on November 1st when Northern Ireland endured a torrid time at Hampden. Dundee’s Billy Steel scored four in a 6-1 win. The month after came a third full cap with Austria winning a challenge game at Hampden 1-0. In 1951 Rovers made it to the semi final of the Scottish Cup where they lost 3-2 to Celtic. The 84,640 to watch at Hampden Park in Celtic`s native Glasgow is the largest ever attendance at a Raith Rovers game. 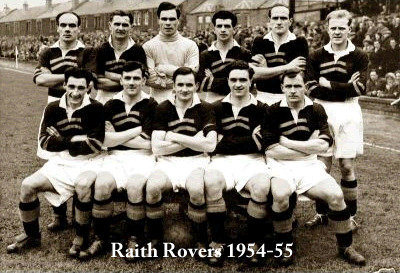 In 1952, Rovers finished the league season as Scotland’s fifth best team. ‘52 brought a brief international recall when McNaught played directly against the excellent Tom Finney in an England side that also included Alf Ramsey, Billy Wright and Ivor Broadis. Reilly again scored for the Scots but this was too little in reply to the Stan Pearson double as the English returned south with an away win. Hardly surprisingly this international against England at Hampden Park brought the biggest attendance Willie McNaught played before throughout his career – 134 504. His fifth and final full cap was on 5th November 1954, again a match against Northern Ireland at Hampden. Danny Blanchflower’s side put on a much better show than the 6-1 defeat returning home with a 2-2 draw with Billy Bingham a scorer. Young was hardly the first nor the last player to remark that playing for a provincial side counted adversely in terms of international selection. McNaught though did play representative football at the level below senior level, notching half a dozen games for the Scottish League. All six resulted in Scottish victory; two games against each of the respective leagues of England, Northern Ireland and the Republic of Ireland. In the 1952 5-1 win in Belfast McNaught played in a international game when three players from the Dumfries locality lined up together. The other two in the triumvirate were Dougie Sharpe and Celtic’s Joe Baillie. The 3-1 win in Dublin in 1954 included two Bobby Black goals. St Mirren`s Willie Telfer, later of Queens, also played. McNaught’s best year in domestic football was 1956. He played in another Scottish Cup semi final exiting the competition after a replay played at Easter Road. The victors were the eventual winners, Hearts, gaining momentum to becoming Scotland’s top team at the end of the decade. The greatest single result of McNaught’s club career was in December of the same year. Rangers were on the end of a 5-1 blitzing at Stark’s in a season when Rovers for a while appeared genuine title contenders. They finished fourth, surpassing the 51/52 season and their highest finish since 1922 and unequalled since. The same 56/57 season brought McNaught his third and last Scottish Cup semi final appearance and for the third time he was beaten by the eventual winners of the trophy. Like the year before Rovers went out after a replay, this time to Falkirk. 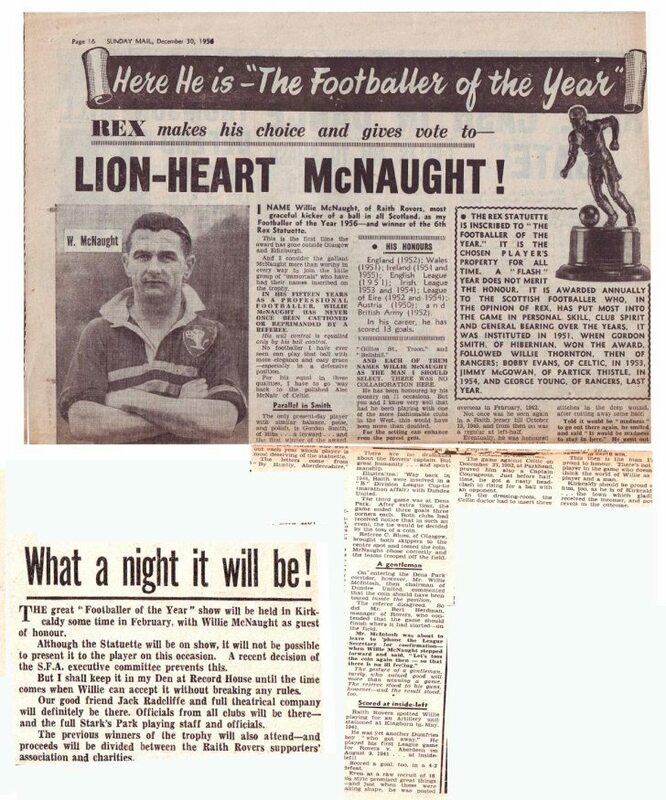 McNaught was announced on 30th December 1956 as being the sixth Sunday Mail player of the year, a fore runner award to the Scottish Football Writer’s Player of the Year award that first appeared in 1965. The presentation ceremony at the Rio Cinema in Kirkcaldy was scheduled for Feb` 1957. Preceding winner of the award and Scotland Captain, George Young of Rangers, was among those to make a speech (footage of the event is on the British Pathe website). The player of the year after McNaught was Alex Parker, Scottish Cup winner with Falkirk in `57 and a 1963 league championship winner with Everton (Parker lived the latter years of his life in Gretna). Raith were relegated the season after McNaught`s 1962 departure to Brechin City. When he played his last game for Raith he was a week short of his 40th birthday. At Brechin he played five league games. He retired from professional football after Brechin and never played for Queen of the South. Someone in his family who did though was his brother John McNaught. He played for Queens eight times between 1962 - 64 in the George Farm era. Jim Baxter in an interview on his career was asked if joining the senior ranks was the beginning of his football education. Baxter found the idea of being given any sort of football education laughable before then commenting on McNaught. Describing McNaught as, ‘a smashing guy’, Baxter explained how instead of thoughtlessly charging forward with the ball, McNaught suggested more considered football – change from running 30 yards to produce a five yard pass to running five yards and producing a 30 yard pass. This, Baxter then stated, was his football education with Willie McNaught the provider. Willie Bauld, King of Hearts, was rarely inclined to comment favourably of his direct opponents and more inclined to sumarise them as cloggers. Bauld though credited Willie McNaught as a player he respected tremendously as the man who Bauld said was his most difficult opponent. 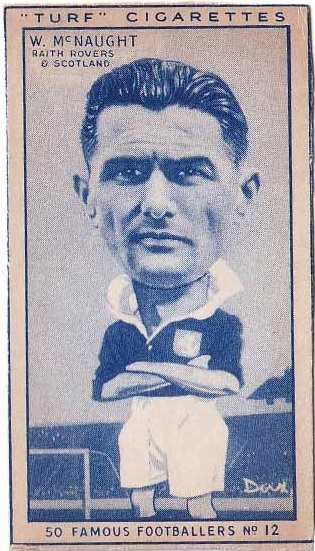 Former Raith team mate, Jim Menzies, “I fondly remember the veteran Willie McNaught who was a real gentleman and an inspiration for the younger players.” Tom Dawson played with McNaught in retirement with Fife all-stars commenting, "The guy that amazed me in those games was ex-Raith and Scotland star Willie McNaught. Even at the age of 52 he would just stroll through games." McNaught’s legacy continued after he retired from professional football. His son, Ken McNaught, was born in Kirkcaldy in January 1955. He joined Everton as an apprentice in 1971 after a trial in which he played directly against an established first teamer, Joe Royle. Starting training on the Monday after the Friday he had left school, a year later he was joined by a certain John Connolly signing from St Johnstone. Big, strong, intelligent and a tough but fair tackling centre back, McNaught junior`s first team debut was in the FA Cup against Altrincham on 4th January 1975, a week before his 20th birthday. Billy Bingham, scorer against his dad`s Scotland team all those years before, was then manager. McNaught played in the 1977 League Cup Final against Aston Villa, losing after a second replay. 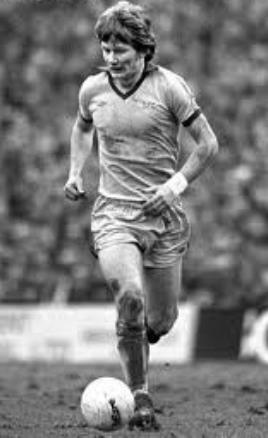 McNaught made an impression with his outstanding performances and Villa Manager, Ron Saunders, tried to sign him after the season’s end a few weeks later. 22 year old McNaught had seen his future as being at Goodison where he was already a fans favourite with his obviously massive potential. However Bingham was months gone and Gordon Lee wanted cash for a new keeper (George Wood), and a winger (Dave Thomas). It cost Villa £200 000. McNaught played for Everton 86 times and was the only ever present in his last season on Merseyside. He scored three Everton goals. Initially McNaught wasn`t a success at Villa with a defensive partner with whom he was unsuited, Leighton Phillips. Phillips soon made way for John Gregory with some improvement. McNaught then though made a suggestion to Saunders that Allan Evans, big, quick and preferring to defend on the right as a balance to McNaught`s preference to defend on the left, drops back to play as McNaught`s central defensive partner. And so the bed rock was laid that was the foundation of the fantastic success Villa enjoyed in the next few seasons. McNaught picked up a league winner’s medal in 1981 not missing a game of the title winning campaign. The season after he scored against Dinamo Kiev in a European Cup quarter final. In the final Paul Breitner of Bayern Munich ran the midfield and with Karl-Heinz Rummenigge in the attack, McNaught and Evans had a busy game as did keeper Nigel Spink. They kept a clean sheet though for the Birmingham club to lift the trophy 1-0. McNaught played in the two legged 1983 UEFA Super Cup final against a dirty tricks Barcelona side. In extra time Gordon Cowans had a spot kick saved but made no mistake slamming home the rebound from six yards. Urruti in goals for Barca responded by clobbering the legs from underneath Cowans in what was nothing less than assault. A chaotic scene ensued with Urruti running round the penalty box like a headless chicken doing goodness knows what. He ended up in front of McNaught. Seeming to sense Urruti was afraid someone would banjo him in retaliation, super composed McNaught put his dooks up and bobbed his head Sugar Ray Leonard style before laughing at his nonsensical opponent. Four minutes later Cowans swung over a free kick from the left for McNaught to throw himself at and thump in a diving header. His goal wrapped up the scoreline 3-1 on aggregate. 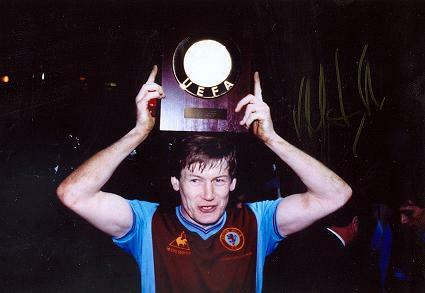 This is the best known of McNaught`s 13 goals in his 260 Villa appearances. He then played for three clubs in three seasons, West Brom, Man City and Sheffield Utd before injury forced him into retirement at the age of 31. He’d had knee surgery at Villa in 1981 developing a deep vein thrombosis. He rejoined the first team after a four month lay off but the clot remained in his calf impacting his mobility. His last years in the game were spent battling recurrent swelling. He retired when told a leg break could lead to the loss of the limb. Unlike his father, Ken McNaught never played for Scotland at senior level despite his consistent performances and considerable and impressive achievements with Villa. He is thus a Scottish winner of Europe’s top club competition to never have collected a full international cap. This point he shares along with John McGovern, captain of Nottingham Forest to the European Cup in each of 1979 and 1980. A post script to the originally published article above. On 12th November 2012 Willie McNaught was one of eight players in the initial inductees into the Raith Rovers Hall of Fame.